The newest class of Wabash men steps onto campus this weekend as President Gregory Hess will ring in the freshman class Saturday in Pioneer Chapel. Hess is expected to welcome 226 young men on their first official day on campus. 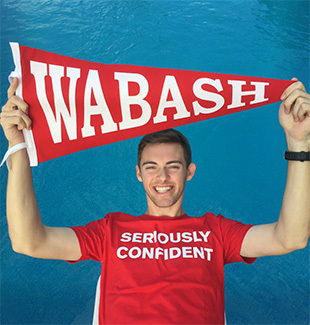 Freshman Saturday is the first step for the Class of 2020 along its journey to commencement with an introduction to the traditions that Wabash College holds dear. Check-in opens in the Allen Center at 9 a.m. In addition to the hustle and bustle of moving into residence halls and fraternities, there are panel discussions for parents, opportunities to meet and interact with the deans and faculty. One of Wabash’s most time-honored traditions – the “Ringing In” ceremony – starts at 1 p.m. and marks the official beginning of students’ lives as Wabash men. Using the hand bell that once belonged to the College’s first teacher, Caleb Mills, President Hess will ring in this class, as Mills did 184 years ago. Dean of Students Michael Raters ‘85 will welcome everyone in attendance, while Dean for Enrollment Management Michael Thorp ‘86 will discuss the unique attributes of the Class of 2020, and Rob Shook ‘83, President-elect of the National Association of Wabash Men, will welcome students and parents on behalf of the alumni. The day ends with an introduction to the Gentleman’s Rule for incoming students. Orientation continues through Wednesday with presentations on various areas of academic support, meetings with advisors, class registration, and a picnic hosted by the president. All members of the Class of 2020 participate in community service activities throughout Montgomery County on Wednesday before the day ends with the annual Dean’s Dessert, jointly hosted by the Dean of the College and the Dean of Students. Classes begin on Thursday, Aug. 25. The full orientation schedule is available here.